Today we are honored to listen to Cynthia Winnie who placed tenth in the 7th Venus Index Transformation Contest. Cynthia silenced the inner fat girl voice and found the real girl was the strong and confident girl. Cynthia’s pictures before the 12 week contest. Cynthia’s pictures after the 12 week contest. In July of 2011, I weighed my heaviest at 220lbs and size 20. I decided to start watching what I eat. I began logging my food into a website called myfitnesspal. There I met many Venus women. One in particular was named Californiagirl (Bobbie). I watched what she ate and lost 18 pounds by the beginning on 2012. The weight loss gave me the confidence to join a gym and I lost 40 pounds. However, by the end of the year, I felt like I hit a plateau. I looked in the mirror and I was just a small fat person. I looked for an exercise program to shape my body. I saw some Venus women talk about their exercise programs and I loved their after photos. So I bought the Venus index for myself for Christmas. I started in December. I was 165lbs and size 10 when I started the Transformation. With every new week, I was challenged with each new exercise. Very quickly I watched my shapeless body take shape. I am not an ‘after’ as of yet, but well on my way .I am 155lb, a size 6. I love the Venus Index exercises and the Eat Stop Eat guidance. I fast one day a week and stay under 1000 calories a day, 6 days a week. I have utilized the Venus Community for the many questions I have during this journey. I thank you for the Community and the knowledge you have given me. 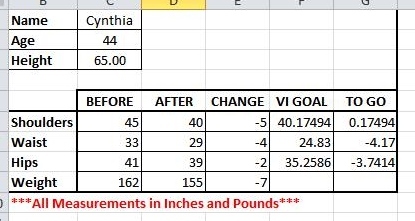 Cynthia’s total transformation so far. With her new confident and strong Venus mindset she plans to keep going. I have no doubt she will achieve her goals.